Tone is in the hands, or so the old adage goes. Certainly, the size and shape of an acoustic guitar’s body, the style of its bracing, and especially the tonewoods used conspire to help shape your sound. But good tone is largely about how your hands interact with the strings. While not everyone has the same idea of ideal tone, a thin and trebly sound tends to define bad tone. Fortunately, you can improve your approach to the instrument to get the complex, warm sound accentuating lower frequencies that acoustic guitars are designed to foster. With plenty of mindful practice, these simple steps can help you get the best sound out of your acoustic, whether that's a small and cheap GS Mini or a big and pricey 000-18. Professional guitarists often talk about pulling the tone out of their guitars. Rather than hammering away on the strings and hoping for the best, they make conscious effort coax warmth from their instruments by adjusting how they strike the strings. Whether you’re a finger picker, a flat picker, or a combination of the two, it’s worth developing a zen–like focus on your attack while practicing. Experiment with all of the different angles you can imagine for picking your strings, and pay close attention to the subtle differences. Additionally, let the strings ring. An acoustic guitar is different than an electric, so embrace the rich resonances shaped by the soundbox. Getting those resonances is much more important than getting loudness out of your guitar, since hard playing will actually diminish the complexity of your tone. The most common picks used for acoustic are dubbed “medium,” somewhere between 0.65mm and 0.73mm in thickness. But if you’re looking to boost volume and cut through the mix or to beef up your single–note runs, use an extra heavy pick between 1mm and 1.5mm, or even thicker. Country picker Vince Gill, Nashville session ace Darrell Scott, and singer-songwriter Richard Shindell all like their picks thick. 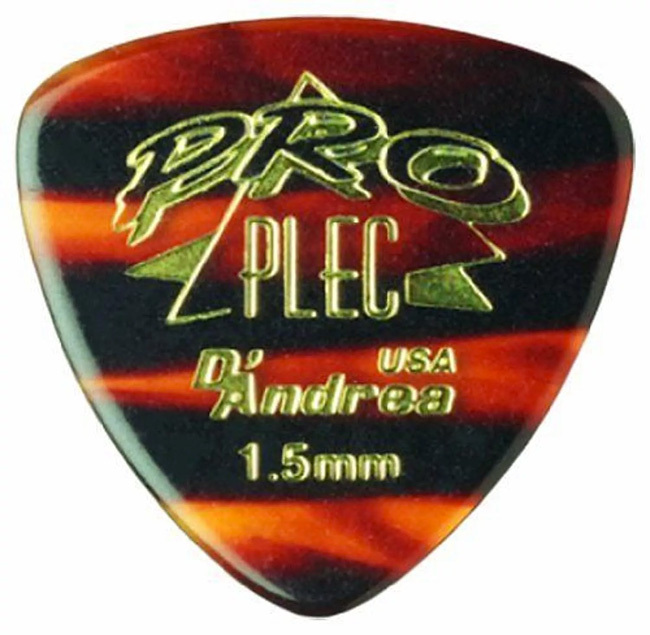 Tommy Emmanuel even has his own signature 1.5mm D’Andrea Pro–Plec. Gypsy-jazz players often use heavy picks as well. The results earned with a heavy pick can be quite intoxicating. You also might try using a pick with beveled edges, which can alter your attack and increase picking speed. For a warmer tone, try picking with the rounded corners of the beveled pick instead of its pointed tip. While you’re at it, try exploring the different materials used in pick production, including celluloid, and such proprietary materials as Dunlop’s Tortex. Fingerstyle players should try different nail lengths and nail shapes. And don’t forget that big fleshy pad on the thumb of your picking hand. It’s custom-made for a fat, warm tone. Next, explore the different tones produced when picking at various locations between the bridge and neck. Picking close to the bridge — especially with a thin or medium pick — will produce a brighter, thinner, near–percussive sound, but it can also weaken the string and contribute to breakage. Picking close to or over the neck can produce a bassy tone, put it may lack some punch. Generally, you want to stick to the soundhole. Just behind or slightly over the soundhole is the sweet spot for many players to pick. Accomplished guitarists often pick in one location for rhythm and another for solos. Some, though, will strum in a rotating motion that carries the pick over a range of locations. This technique, perhaps needless to say, makes for a more varied and complex sound. Acoustic guitar string technology has gone through many changes over the years. Martin used steel when inventing the first ever metal guitar string in 1927. Five years later, Martin introduced phosphor–bronze alloy strings that still dominate the market. Today, some manufacturers use a variety of wraps including titanium, silver, and even gold cores. Peter Rowan, Tony Rice, and other bluegrass, folk, and blues players prefer nickel–alloy strings (sometimes with an unwrapped third string) on account of these strings’ warmth. Martin sells these “monel” nickel–alloy strings under in its Retro line. Have you purchased an acoustic guitar with coated strings? Coating theoretically protects the strings’ metal from corrosive sweat and skin oils. Sure, sweat and oil can dead strings over time, but the coatings do a decent work themselves to deaden tone. If you have those kinds of strings on your guitar, you may be pleasantly surprised by how your tone changes when you switch to an uncoated set. And while most players insist that a heavy gauge string will produce the fattest tones, the tension of the strings is just as important. Tension, not thickness, determines the relative volume of a string. For the curious, Santa Cruz Guitar Co. offers low– and mid–tension string sets. There’s no better way to add thunk to your tone than palm muting. The technique is simple: make light contact with the strings with the heel of your picking hand, especially while strumming. Palm muting can add a rich percussive effect to your tone. Greg Brown uses palm muting to this effect, heard best on his sardonic “Boomtown” from the Live One album. Singer–songwriter Ani DiFranco has said that she started using palm muting for emphasis in loud bars, and it has become a signature element of her sound. Tension is the nemesis of tone and a major contributor to repetitive strain injuries in guitarists. Tension, from your shoulder through your fingers, will stifle your technique. It slows down your single–note runs and chord changes and will result in hand fatigue after long periods of playing. How do you solve that problem? Shake out and stretch your hands and fingers before and after playing to rid your hand of excessive tension. Work on finding that good balance between total relaxation and the control you need to pick effectively. A good luthier will watch you play before setting up your guitar. He will watch how hard you strike the strings, where you typically fret your chords, and what your strumming tendencies look like. Comfort–conscious players often want the lowest action possible in terms of the height of the string above the frets. Low action will increase the ease of fretting — especially with barre chords — but it can also contribute to buzzing that robs your guitar of volume. That can lead you to strike the strings harder, thus compromising your tone. A luthier will also look at the angle at which the strings break from the saddle, how well the nut fits and other fine adjustments that can make your guitar comfortable. That way, you can focus on getting great tone instead of wrestling with your axe.